Do you consider your bedroom a sleep sanctuary? If not, it may be the reason why you’re not catching enough ZZZ’s each night. 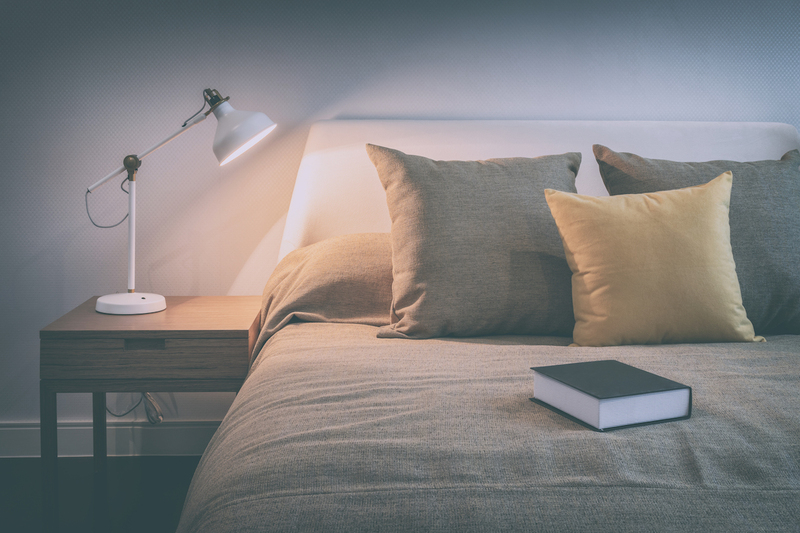 Considering we spend a third of our lives in our bedrooms, it’s essential that space be a welcoming, comfortable oasis at the end of each day to properly recharge. Now is the time to transform your bedtime routine and turn your bedroom into a relaxing retreat. Discover five essentials for creating a sleep sanctuary and getting a great night’s sleep. People tend to look forward to sleep more when their sheets have a fresh scent, according to the National Sleep Foundation’s Bedroom Poll . Aim to wash your sheets and pillowcases once a week with a detergent that has a pleasing smell or is odor-free, if that’s your preference. If you prefer smelling a scent at night to relax, try incorporating lavender into your bedtime routine. Opt for oils or candles to ignite the scent that has been shown to decrease heart rate and blood pressure, according to the global voice in sleep health . A clean, fresh smelling bedroom creates a more inviting atmosphere for relaxation and sleep. Don’t forget to wash away the day’s stress and brush your teeth before heading to bed. Putting these activities into your nighttime routine can help put yourself in a frame of mind that means bedtime. The bedroom should be a technology-free zone. It’s no place for laptops, TV’s, buzzing phones or other electronic devices that cause distractions or elicit stressors. Switch your phone to sleep mode at least 30 minutes before bed and resist the urge to scroll through social media before flipping off the light. The light and brain stimulation from watching TV or being on your phone makes it especially difficult to fall asleep. Try replacing your favorite show with a book. When your bedroom becomes solely a place for winding down and sleeping, your mind will know when it’s time to relax and recharge. Keeping your bedroom cooler than the rest of the home helps prepare your body for sleep because people tend to feel sleepy when their body temperature drops. The National Sleep Foundation recommends a bedroom temperature between 60 and 67 degrees for an optimal sleep atmosphere. Bonus points if you take a warm bath or shower prior to bed to create even more of a temperature contrast. If you tend to be a hot sleeper, you may want to invest in cooling sheets. They’re breathable and won’t trap heat in your bed or stick to your body if you sweat during the night. When shopping for sheets, avoid synthetic materials and aim to keep your thread count between 300 and 400. Did you know even a little bit of light could be keeping you up at night? Combat light pollution in the bedroom with blackout curtains and ensure any light-omitting devices, such as a clock, are turned away from view. If you’re still having issues with getting the right amount of shut-eye, take a closer look at your sleep patterns by keeping a sleep diary or using a sleep monitoring app. It could be quite revealing. If you’re still having issues with getting the right amount of shut-eye, a visit to the doctor’s office may be in order. If you’re a Bright Health member, you can find someone in your network through the Provider Finder tool in your Member Hub. Bright On! Sleep monitoring apps record your movements to track your sleep cycles, which could give you insight into what is really happening after you fall asleep.